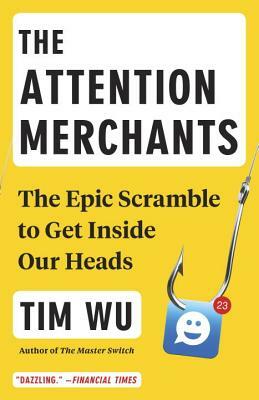 From Tim Wu, author of the award-winning The Master Switch ( a New Yorker and Fortune Book of the Year) and who coined the term "net neutrality”—a revelatory, ambitious and urgent account of how the capture and re-sale of human attention became the defining industry of our time. Ours is often called an information economy, but at a moment when access to information is virtually unlimited, our attention has become the ultimate commodity. In nearly every moment of our waking lives, we face a barrage of efforts to harvest our attention. This condition is not simply the byproduct of recent technological innovations but the result of more than a century's growth and expansion in the industries that feed on human attention. Wu’s narrative begins in the nineteenth century, when Benjamin Day discovered he could get rich selling newspapers for a penny. Since then, every new medium—from radio to television to Internet companies such as Google and Facebook—has attained commercial viability and immense riches by turning itself into an advertising platform. Since the early days, the basic business model of “attention merchants” has never changed: free diversion in exchange for a moment of your time, sold in turn to the highest-bidding advertiser. Full of lively, unexpected storytelling and piercing insight, The Attention Merchants lays bare the true nature of a ubiquitous reality we can no longer afford to accept at face value. Tim Wu is a policy advocate and professor at Columbia Law School. In 2006, Scientific American named him one of fifty leaders in science and technology; in 2013, National Law Journal included him among “America’s 100 Most Influential Lawyers”; and in 2014 and 2015, he was named to the “Politico 50.” He won the Lowell Thomas Gold medal for travel journalism and is a contributing opinion writer for The New York Times.